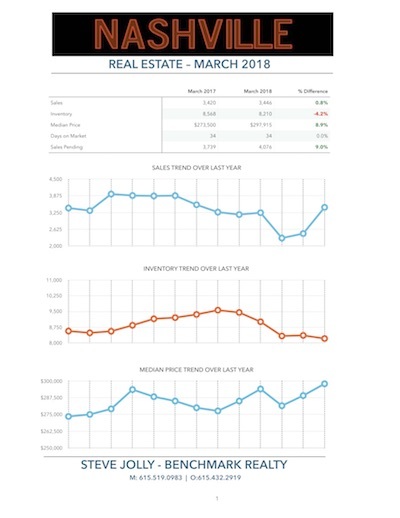 No big surprises in the real estate market number for Nashville in March 2018. And that’s good news for you and me. The continuing story is as old as business itself. What we see are the laws of supply and demand shaping the market for the next group of buyers and sellers. Since we are on the front side of the busy season, we don’t know exactly what it will look like this year. However, all indicators so far expect it to be strong. At the end of March, there were 4,076 home sales pending. That is the largest number of pending homes that I have seen ever in the history of Nashville real estate. We typically have around 3,000 homes pending in March and don’t begin to approach 4,000 until you get to the middle of the year. Some of it may be due to a slower in normal January and February. I think the cold weather put a damper on early sales, but that doesn’t account for all of it. I expect it has to do with some pent-up demand left over from the mortgage crisis, and the number of people moving to Middle Tennessee every day. That strong demand can’t last forever in a tight inventory market. While the inventory is finally holding steady, it will need to grow this spring to keep transactions flowing and prices in check. A combination of a growing demand and limited supply has put upward pressure on prices. After a few years of 10% average growth, buyers are leery of paying too much for a home. Who wants to get stuck like so many did just a few years ago. New construction is helping, but it cannot solve this problem alone. As prices continue to grow, buyers will decide to change their plans and wait. I see this as a healthy reaction because it helps us to grow at a sustainable rate. When the same thing happened in Los Angeles, Atlanta, Miami and elsewhere in 2006, buyers ignored the warning signs and paid dearly. I still expect 6-8% appreciation on average for Greater Nashville this year, and the number agree so far. The Daily Deal in Nashville is this renovated, brick ranch home near One Bellevue Place that would make a great investment or first home and is listed for less than $260,000.